I am ridicuously excited for the American School Counselor Association National Conference in Philadelphia, PA! The ASCA Conference is from Sunday, June 30th until Wednesday, July 3rd. This will be my third time presenting at and attending the conference. Whether this is your first time, 60th time or you are thinking about attending the ASCA Conference next year, here are some tips and information to make your conference experience enjoyable and memorable! The absolute best thing about the ASCA National Conference is connecting with other school counselors! There are so many opportunities to meet and interact with school counselors from all over the country and the world! Get out of your comfort zone and talk to others! Go out to dinner with other and explore the city with other school counselors! You will have a blast! I had so much fun meeting and connecting with new people in the past and I can't wait to do it again this year! I am hosting (with two of my favorite tech savvy counselors) two fun and informal ways to connect in real life with school counselors you interact with online. Dr. Erin Mason from SCOPE and I are hosting the 2nd Annual School Counselor Tweet Up on Sunday, June 30th during the Dance Social in the Grand Ballroom of the Philadelphia Marriott Downtown. 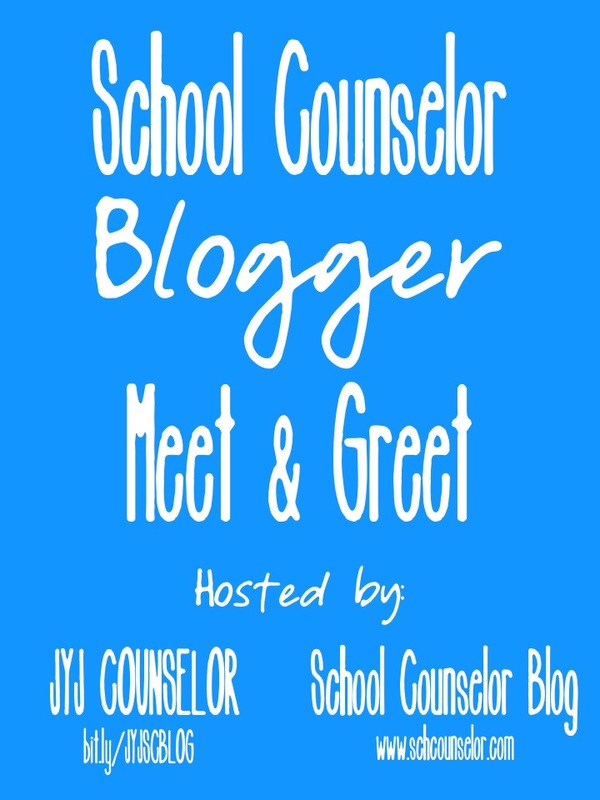 Andrea Burston from JYJ Counselor Blog and I are hostin the first ever School Counselor Blogger Meet and Greet at 8pm on Tuesday, June 2 in the lobby of the Philadelphia Marriott Downtown. All are welcome to attend both events! Since I have been attending the ASCA National conference I have been super impressed with their conference app! It is so cool that the ASCA conference app enables you to have access to the schedule and information at all times in the palm of your hand. Even if you are not attending the conference, you are able to access and download documents from each presentation! I highly recommend you download the ASCA conference app or check out the app website! People who have roomed with me always are shocked by my miniscule amount of luggage. I somehow have perfected the art of packing what I need and not going overboard. It is probably because I obsess about what I am packing for the ASCA Conference weeks in advance! I think I pretty much have everything mentally packed. ;) If you are presenting I recommend bringing a suit or some dressier items. If you are attending the conference I recommend business casual. Also, leave some room in your bags for items you might purchase at the conference! There are TONS of booths with books, resources, school counselor apparel, and super cool items you can buy for your school counseling office! This year, I wont be packing as light because I will have lots of giveaways packed in my bag for the School Counselor Blogger Meet and Greet! Squeeze some time into your schedule to enjoy Philladelphia! There are lots of cool things to do in Philly! Some of the things I am looking forward to doing are taking pictures at LOVE park, getting breakfast at the Reading Terminal Market, and trying out some local restaurants, including Sbraga! Check out Visit Philly for ideas of things to see and do! 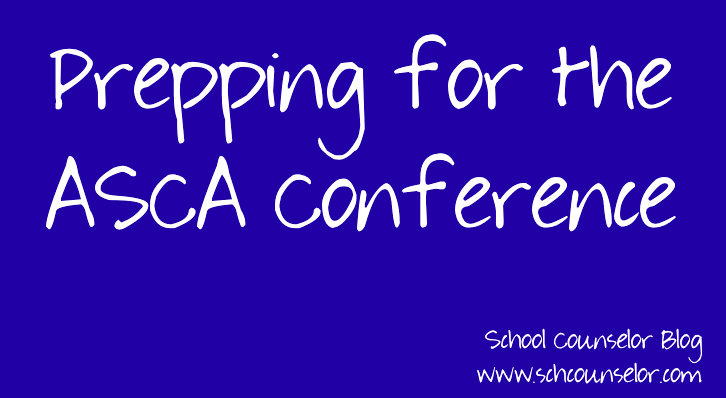 What are your suggestions and tips for attending the ASCA National Conference? What questions do you have about attending? 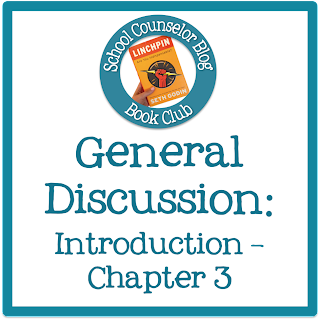 Our second discussion of the School Counselor Blog Book Club begins Wednesday, June 26th on the School Counselor Blog Facebook Page! 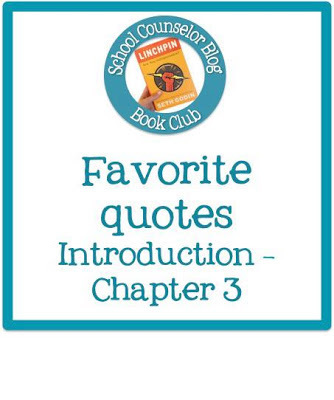 We will be discussing Chapters 4 and 5 of Linchpin by Seth Godin. I look forward to kicking off our second week of discussion of Linchpin by Seth Godin with you! Click on the images below to participate in the discussions of Chapters 4 and 5! This past week was a whirlwind. My dad took me to New York City to Embracing the Possibility: A Full Day of Question and Answer Session with Seth Godin, the author of our School Counselor Blog Book Club book, Linchpin! 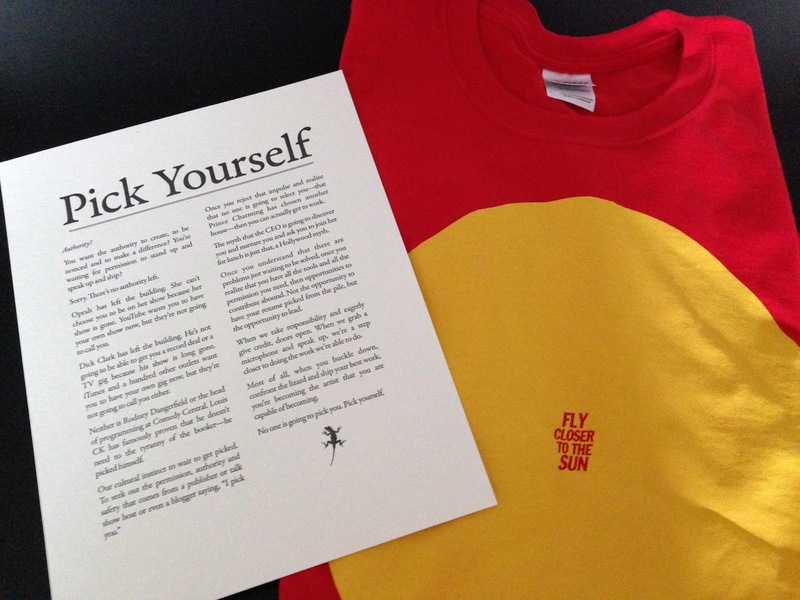 While I was at Embracing the Possibility, I got five red shirts that say "Fly Closer to the Sun" and five "Pick Yourself" letter press excerpts from The Icarus Deception, Seth Godin's newest book. I will be giving them away in person at the ASCA Conference in Philadelphia! If you have been participating in our book discussion of Linchpin and will be attending the Blogger Meet and Greet you have the opportunity to receive one of the five shirt/letterpress giveaways! To win, come up to me at the Blogger Meet and Greet, say the secret code: SCHOOL COUNSELORS ARE LINCHPINS! - and I will give you a shirt and letterpress copy of "Pick Yourself." (Just an FYI, the shirts are all size large). I love the message of the "Fly Closer to the Sun!" As a school counselor I think this is a great message to convey to students. I previously wrote about an activity I did using Wings by Christopher Myers. Wings is about a boy, Ikarus Jackson, who is a new student. Ikurus has wings. The other students make fun of him because he is different. Wings is about being true to yourself. It is also a great book to talk about bullying and being a positive bystander. Wings by Christopher Myers and The Icarus Deception by Seth Godin both reference the Greek myth about Icarus and Daedalus. The moral of the Greek myth is not to fly too close to the sun or to low to the sea. "Fly Closer to the Sun" means be remarkable - don't be afraid to be different! I wish I would have had this shirt when I did my Wings activity with students! How do you help students fly closer to the sun? The First Discussion of the School Counselor Blog Book Club! 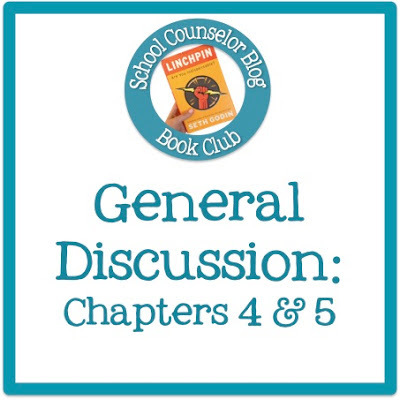 Our first discussion of the School Counselor Blog Book Club begins Wednesday, June 19th on the School Counselor Blog Facebook Page! We will be discussing the Introduction, Chapter 1 (The New World of Work), Chapter 2 (Thinking About Your Choice), and Chapter 3 (Indoctrination: How We Got Here) of Linchpin by Seth Godin. Discussion questions and themes to discuss will be posted on the School Counselor Blog Facebook Page. Check in and discuss throughout the day! 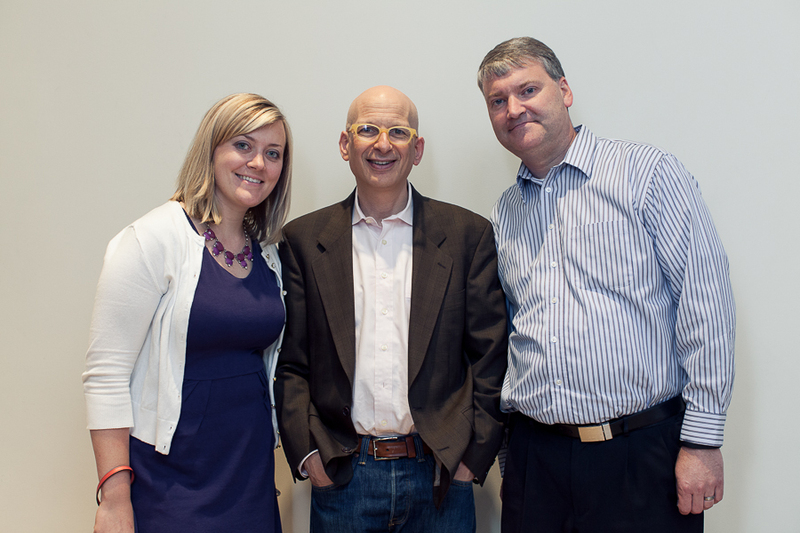 I look forward to kicking off our discussion about Linchpin by Seth Godin with you! Click on the images below to participate in the discussion of the first three chapters! Are you excited to kick off our discussion? I have a new post on Free Spirit Publishing's Blog, Supporting Student Athletes. School counselors are in a unique role where they can support the success of student athletes on and off the field. I provide ideas of how you can support student athletes at your school. How do you support student athletes in your role as a school counselor? 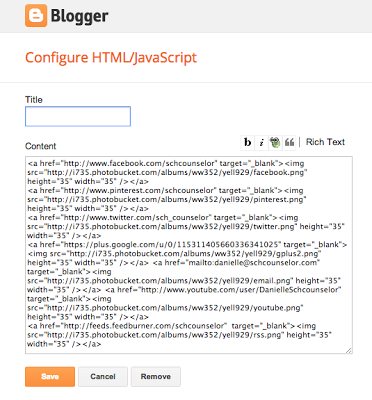 How to Add Social Media Icons to Blogger: Get Your Blog On! I recently installed social media icons on my blog. This was a simple project that I wish I would have done this a long time ago! I did a Google search for adding social media icons to Blogger and found great step-by-step instructions on My Favourite Things Blog. After adding the social media icons, however, I realized that when I clicked on an icon the website opened in the same page as my blog. I wanted readers to be able to click on a social media icon and have the social media site open in a different window. So, I did some more Google-ing to find a html code for opening a website in a new page. I decided to make a tutorial to break it down into smaller steps and give you a code that will open the social media sites in a new page. 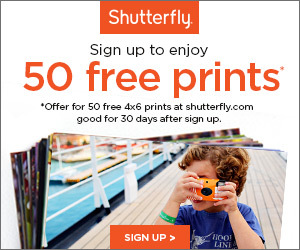 To add social media icons to Blogger, you will first need to subscribe to an image hosting website. The website where I originally found a tutorial recommended Photobucket, so that is what I used. Photobucket was super easy to use. Next, you will need to find some social media icons that you like. There are many sites where you can download free social media icons. I pinned some free social media icon to my Blogging board on Pinterest. 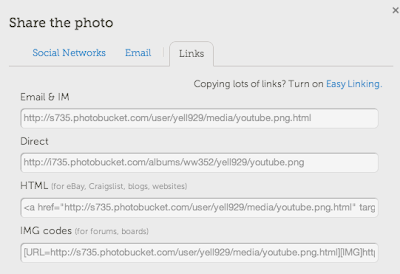 After you find a social media icon set that you like, you will need to download the images to your computer. 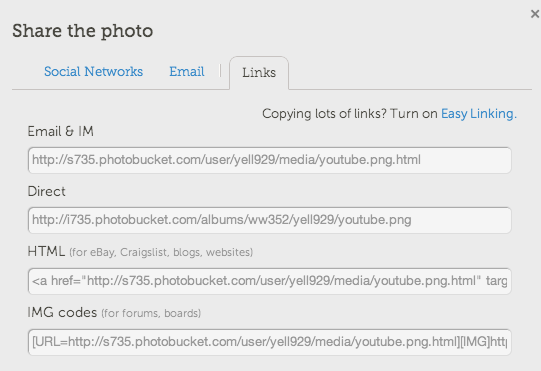 Once the social media icon files are downloaded to your computer, you can upload them to the photo hosting website of your choice. 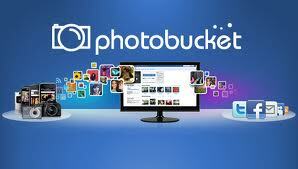 I chose Photobucket because it is easy to use and easy to find the code that you will need to copy later. Or you can click on the gear in the screen where all of your images are stored. Click on "get links" and a window with all of the links will appear. For what we are doing you only need the DIRECT link code. It is the second one down. You will copy and paste the direct image code for each of your social media icons... more about that at the bottom. 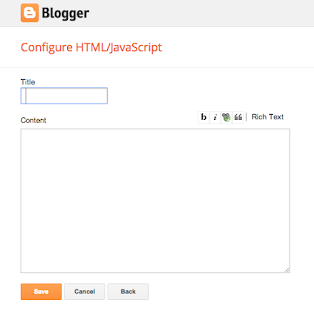 In Blogger, go to the layout screen. Then, click on add a gadget. A screen will open that looks like this one below. 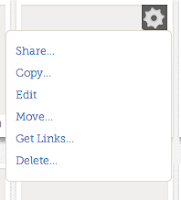 The orange text is where you will put the social media website link. 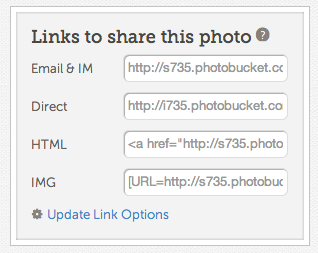 The green text is where you will put the direct link for your social media icon image. The purple text is where you will pick the size for your icons. NOTE: Do not just copy and paste this code into your content area or it will link people to the School Counselor Blog Facebook page. You need to change it so that your facebook page or social media site address is in the orange text, the link to your image is in the green part, and you have chosen a height and width for your icons in the purple text. 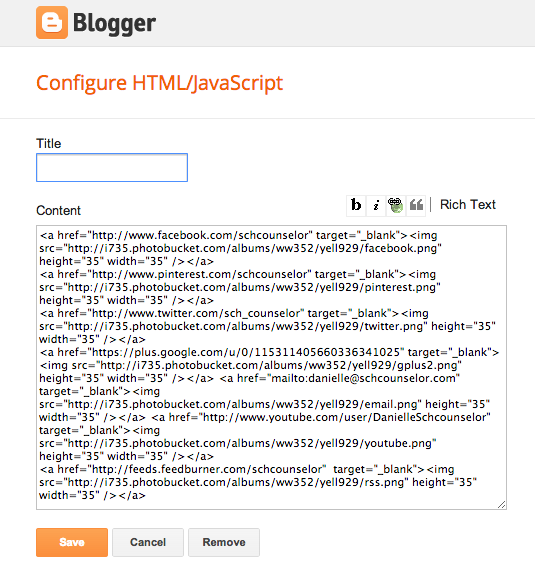 After you add one you can continue to copy, paste, and modify the code for each one of your sites. The only one that is different is email. The red text is where you put your email address. The green text is where you put the direct link for your social media icon image. The purple text is where you choose the height and width for the social media icon. No need to be alarmed... it is supposed to look like a whole lot of craziness! Hit save and then preview. If everything looks good to you, hit the save arrangement button. 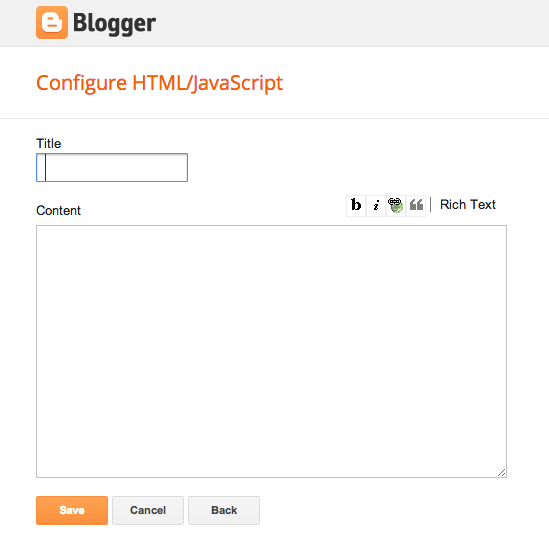 Then in a new browser window, go to your blog and test out the links. Make sure they all work! If they don't, go back and look at your code. Make sure you copied and pasted everything exactly and that there are no extra spaces or characters! Adding social media icons to your blog is a great way to increase traffic to your social media sites. It helps your readers know all of the other places they can connect with you on the web! +Andrea Burston of JYJ Counselor and I are presenting Get Your Blog On! at the American School Counselor Association National Conference. We are both planning to share some more advanced tips and tricks like this one for those of you interested in becoming school counselor bloggers! 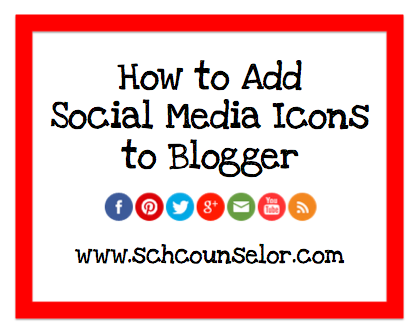 Have you added social media icons to your blog? Share below! 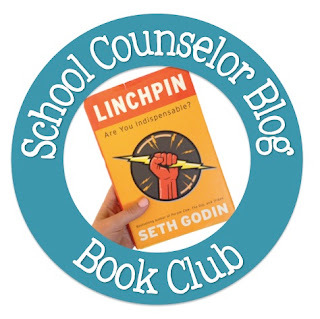 Below you will find a discussion schedule for Linchpin by Seth Godin, the first book in the School Counselor Blog Book Club. 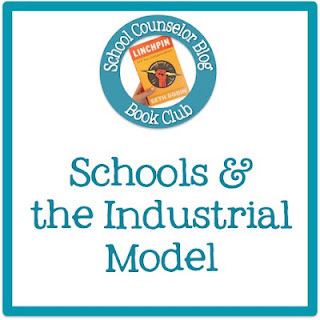 We will be discussing the Introduction, Chapter 1 (The New World of Work), Chapter 2 (Thinking About Your Choice), and Chapter 3 (Indoctrination: How We Got Here) of Linchpin by Seth Godin all day long on the School Counselor Blog Facebook! 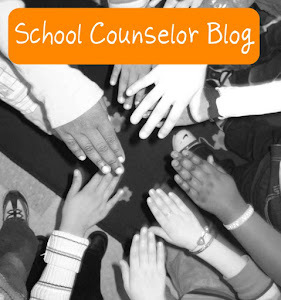 Visit the School Counselor Blog Facebook Page to participate in the discussion! We will be discussing Chapter 4 (Becoming the Linchpin) and Chapter 5 (Is it Possible to Do Hard Work in a Cubicle?) of Linchpin by Seth Godin all day long on the School Counselor Blog Facebook! Visit the School Counselor Blog Facebook Page to participate in the discussion! 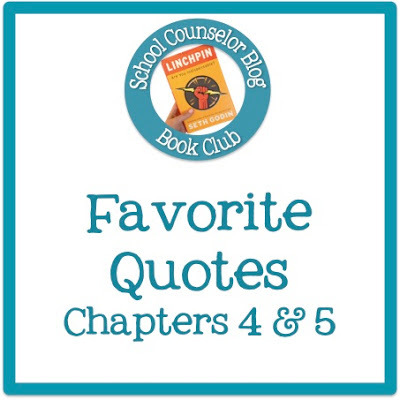 We will be discussing Chapter 6 (The Powerful Culture of Gifts), Chapter 7 (There is No Map), and Chapter 8 (Making the Choice) of Linchpin by Seth Godin all day long on the School Counselor Blog Facebook! Visit the School Counselor Blog Facebook Page to participate in the discussion! 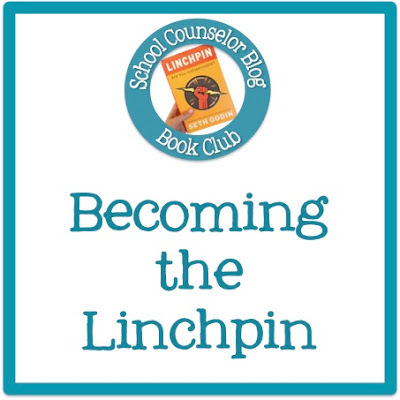 We will be discussing Chapter 9 (The Culture of Connection), Chapter 10 (The Seven Abilities of the Linchpin), and Chapter 11 (When it Doesn't Work) of Linchpin by Seth Godin all day long on the School Counselor Blog Facebook! Visit the School Counselor Blog Facebook Page to participate in the discussion! 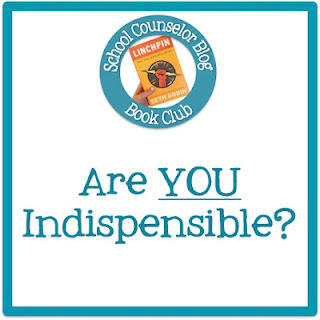 We will be discussing the Summary and Linchpin by Seth Godin as a whole all day long on the School Counselor Blog Facebook! Visit the School Counselor Blog Facebook Page to participate in the discussion! I will also be hosting a Google+ Live Hangout at 8pm EST to discuss Linchpin by Seth Godin in it's entirety. You can view the discussion schedule on the Google calendar below. Head out to your local library, bookstore, Amazon, or Audible to get a copy of Linchpin by Seth Godin. I also recommend checking out Overdrive to borrow books and audiobooks from your local library and get them delivered directly to your e-reader or tablet! School Counselor Blog Book Club Starts on Wednesday, June 19th! 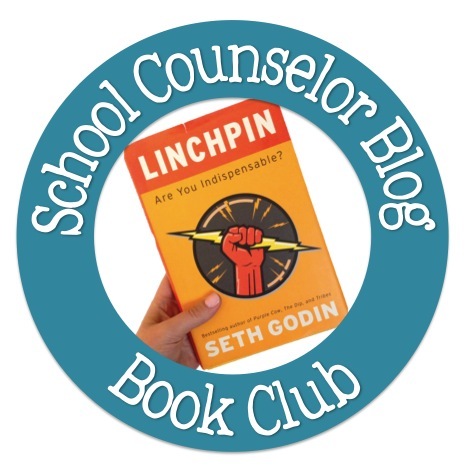 The School Counselor Blog Book Club is reading Linchpin by Seth Godin as a group! Our first discussion of Linchpin by Seth Godin will go live on Wednesday, June 19th on the School Counselor Blog Facebook Page! We will discuss the introduction and first three chapters, ("The New World of Work," "Thinking About Your Choice," and "Indoctrination: How We Got Here"). 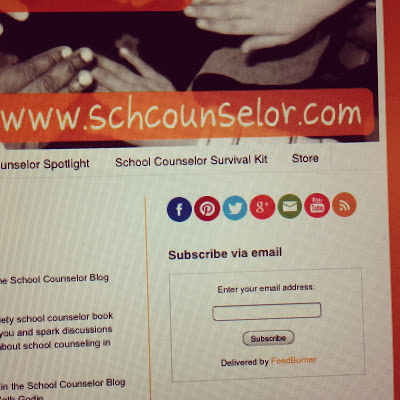 I am looking forward to using the School Counselor Blog Facebook Page since we already interact there! I am so glad that Facebook now enables you to reply to the comments of specific people. 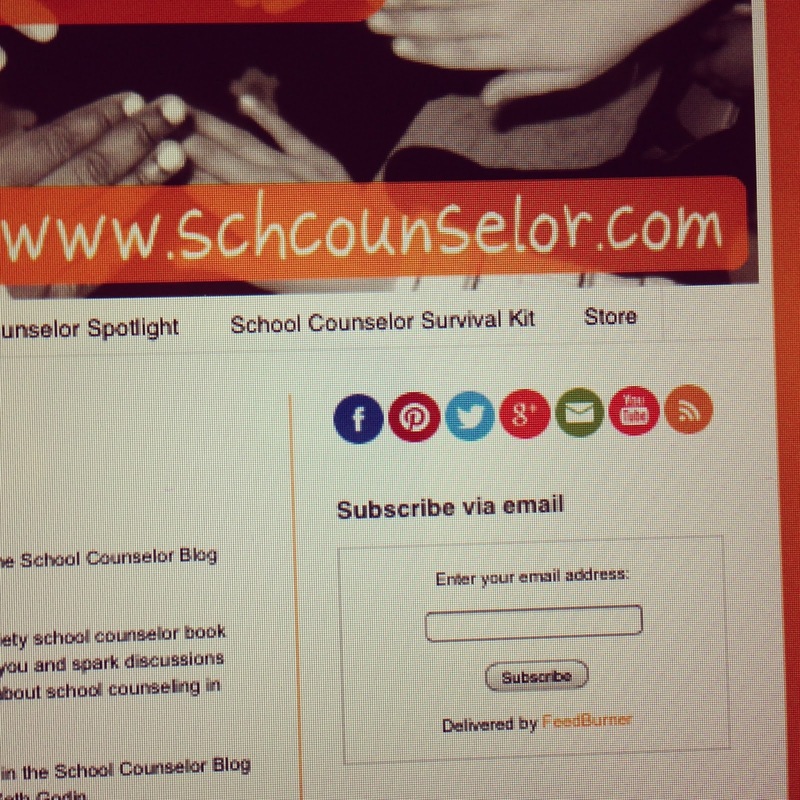 I think the School Counselor Blog Facebook Page will work great for our discussion! I created a Google Calendar (below) where you can view the full reading schedule for the School Counselor Blog Book Club. There is still time to participate! If you have not already done so, head out to your local library, bookstore, Amazon, or Audible to get a copy of Linchpin by Seth Godin. I also recommend checking out Overdrive to borrow books and audiobooks from your local library and get them delivered directly to your e-reader or tablet! I am listening to the audiobook of Linchpin while running in the morning. Seth Godin reads the book, which is great. I love when the author is the one reading on their audiobook! Even if you cannot participate in our first discussion, feel free to catch up with us for a future discussion! I am so excited to read and discuss with you! Meet Your Online School Counselor Colleagues in Real Life at #ASCA13! 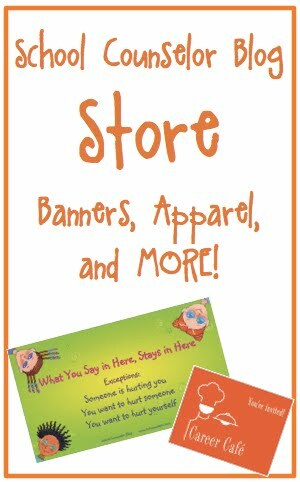 The 2013 American School Counselor Association Conference is only a few weeks away! If you are heading to the conference there are two great opportunities to meet the school counselors you connect with online, IN PERSON! +Erin Mason and I will host the 2nd annual School Counselor Tweet Up during the American School Counselor Association Conference Dance Social in the Ballroom of the Philadelphia Marriott Hotel on June 30th at 8pm EST. The #SCCHAT School Counselor Tweet Up is an opportunity to meet other school counselors who use Twitter to connect professionally. Whether you have been tweeting with us for years or are brand new to using Twitter to connect with other school counselors, you are welcome to attend! We encourage you to RSVP to this event so we can see who is coming and where they are coming from. Individuals who register by June 26th will receive a personalized name tag! To RSVP visit: http://bit.ly/tweetup2013. To learn about Twitter and TONS of other tech tools you can use as a school counselor, come to our session (with +Julia Taylor, +Russell Sabella, +Erin Mason, +Andrea Burston, and +Danielle Schultz (me), Web 2.0 and Technology Smackdown on June 1st at 1:30pm. +Andrea Burston and I are hosting a Blogger Meet and Greet at the American School Counselor Association Conference. This event will take place on June 2nd at 8pm EST in the lobby of the Philadelphia Marriott. 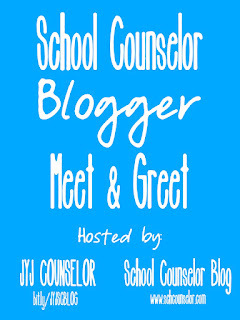 The School Counselor Blogger Meet and Greet is a fun and informal opportunity for school counselors to connect with school counselor bloggers, ask questions, and socialize! We will also be giving away some great prizes during the event! Check out the flyer below to see a full list of school counselor bloggers who will be in attendance! Also, feel free to share the event flyer with others! To learn even more about blogging as a school counselor, be sure to check out +Andrea Burston and my session Get Your Blog On! June 3rd at 9am! Are you attending the American School Counselor Association National Conference? 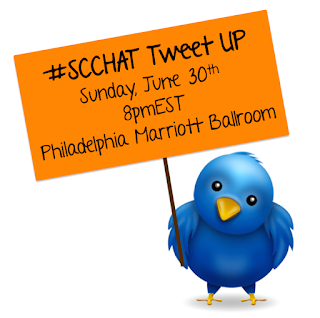 Will you be attending the #SCCHAT School Counselor Tweet Up or the School Counselor Blogger Meet and Greet? I am excited to announce the School Counselor Blog Book Club! This is not your garden variety school counselor book club. My goal is to inspire you and spark discussions which will make you think about school counseling in new and interesting ways. Our first discussion will go live on the School Counselor Blog Facebook Page on Wednesday, June 19th where we will discuss the Introduction and first three chapters, "The New World of Work," "Thinking About Your Choice," and "Indoctrination: How We Got Here." I created a Google calendar where you can access the full schedule for reading Linchpin by Seth Godin for the School Counselor Blog Book Club. So, head out to your local library, bookstore, Amazon, or Audible to get a copy of Linchpin by Seth Godin. I also recommend checking out Overdrive to borrow books and audiobooks from your local library and get them delivered directly to your e-reader or tablet! I look forward to reading and discussing with you all! 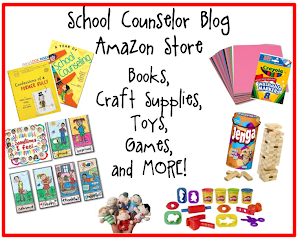 Will you be participating in the School Counselor Blog Book Club? 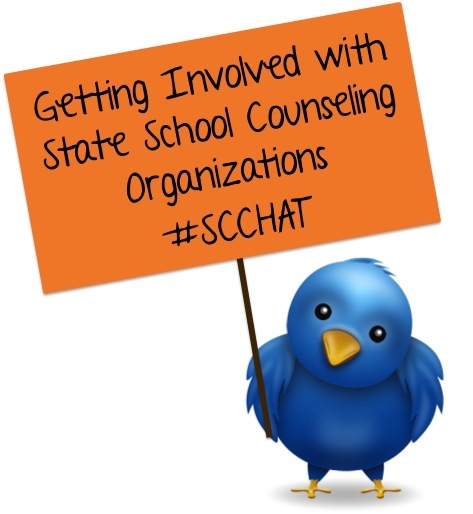 Our June #SCCHAT was held on Tuesday, June 4, 2013 at 8pmEST. The topic was Getting Involved with State School Counseling Organizations. Jeremy Goldman, tweeting using the Maryland School Counselor Association handle (@MSCAMd), moderated the chat. Many state School Counseling Organization leaders participated in this chat. Participants shared ideas on how to get involved with your state chapter of the American School Counselor Association and the benefits of being involved. Participants also shared suggestions for state School Counselor Organizations to improve on services or connect with members. View the transcript below or to read the full transcript in a separate browser visit: June #SCCHAT Storify. The next #SCCHAT will be held on July 9, 2013 at 8pmEST. 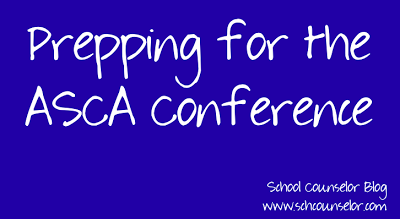 The topic is ASCA Conference Recap and will be moderated by me, Danielle Schultz (@sch_counselor). We will be chatting about the ASCA National Conference in Philadelphia, PA (#ASCA13). I encourage those new to twitter to come and join us and participate! 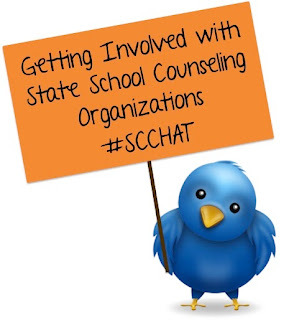 (#SCCHAT occurs on the first Tuesday of the month unless otherwise specified. We changed the date for this one due to the ASCA Conference). This is my second post in the Who's on Your Boat? Series. School counseling is a lot like navigating a boat. 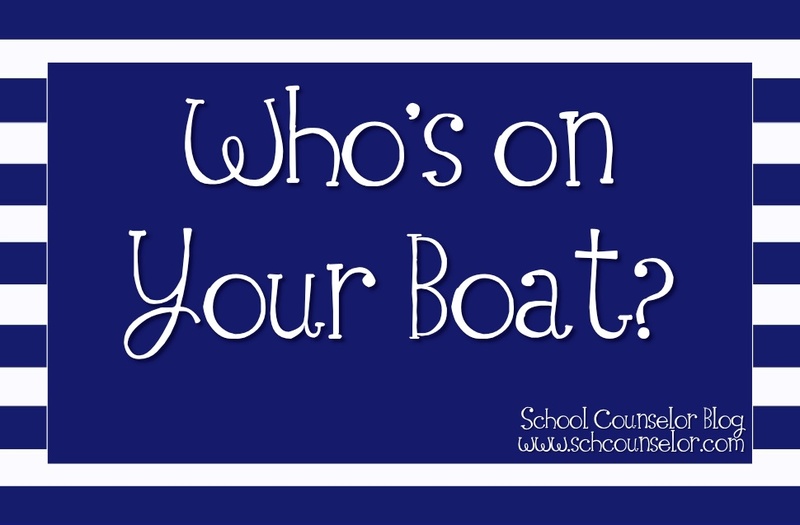 Bringing school staff and other key people "on board" can lead to smooth sailing for you and your school counseling program. 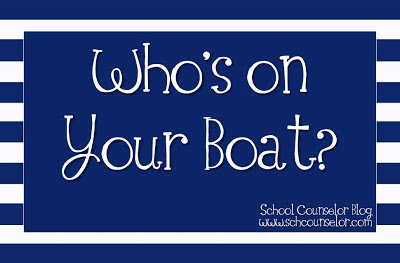 In each post of the Who's on Your Boat? series I will focus on one person or group of people to get "on board" and how they can be beneficial to your role as a school counselor and your school counseling program. My second position after graduating from my school counselor masters program was as a long-term substitute K-8 school counselor at a charter school. I had the pleasure of working with the most amazing art teacher I have ever met, Alison Babusci. I am so fortunate that I was able to work with someone as talented as Alison! The artwork that she makes with her students is seriously out of this world. You can see her amazing work at her blog: Propel Studio 101. One of the many things that I loved about Alison right from the beginning was her willingness to connect with others. Shortly after I started, she invited me to co-teach a lesson with her about rumors and gossip. Alison introduced me to one of my all-time-favorite books to use with students, The Secret Olivia Told Me by N. Joy, which is now, unfortunately, out of print. In addition to our discussion about the message of the book, Alison spoke about the artistic elements of the book such as how the illustrator drew all of the children in the book as silhouettes. Alison and I went on to collaborate in other ways. I told Alison about a lesson I did using the book the The Colors of Us by Karen Katz. Working with Alison, we were able to do a The Colors of Us lesson where the results were above and beyond my wildest expectations. Because we were able to do the lesson in Alison's studio, we were able to use the fancy art materials such as paints, smocks, drying racks, scissors, construction paper crayons, etc. Students loved using paint to mix their own unique color. We displayed the hands as a bulletin board so that others entering the school could see their beautiful colors. Lastly, but definitely not least, Alison helped me to construct an Anti-Bullying Machine, which was based on the book Good-Bye Bully Machine by Deb Fox. Students in the after-school group I facilitated got to use Alison's studio and fancy art supplies, including all kinds of interesting things to trace to make the cogs and pieces of the machine, construction paper, and construction paper crayons. The students had a blast making the Anti-Bullying Machine and I had a blast collaborating with Alison! I highly recommend inviting an art teacher on your boat! She or he will surely make the ride more colorful! inspire and fuel your creativity! There are so many books, lessons, ideas that could be made more amazing by collaborating with an art teacher! educate you of appropriate mediums or technique to use for a lesson or activity. help you brainstorm how to make something better than you ever imagined! help you to showcase students artistic talents. co-teach lessons or units that align with ASCA standards. 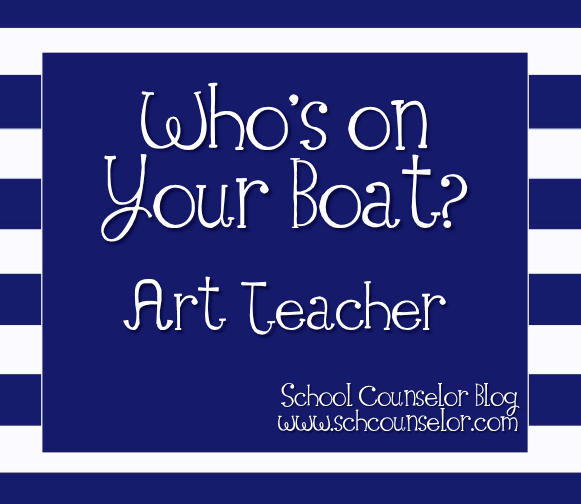 How do you work with your school art teacher at your school? You can also check out my live Google Hangout where I discuss the school counselor/boat concept with +Andrea Burston.